The Amsterdam Brewing Company, Toronto’s independently owned and operated craft brewer, released their Summer Seasonal – Oranje Weisse earlier this week. The beer will be featured while quantities last in both the LCBO and The Beer Store as well as on tap at select bars and restaurants and at the Amsterdam Brewery Retail Store. Oranje Weisse is one of Amsterdam’s most decorated seasonal beers having won 3 medals last year including Gold at the US Open Beer Championships. It also took home a Gold medal at the Ontario Brewing Awards and Silver at the Canadian Brewing Awards. As an ode to Amsterdam’s Dutch heritage, Oranje Weisse is a premium, unfiltered white beer. Predominantly brewed with un-malted wheat, which gives it a hazy appearance, Amsterdam has also added two types of orange peel and some coriander resulting in a unique flavour combination of citrus and light spice. The release of Oranje Weisse will be celebrated at an Amsterdam Brewery Open House on Wednesday, May 9 during a special summer tasting session from 6-9 pm. All are welcome for food and drink. 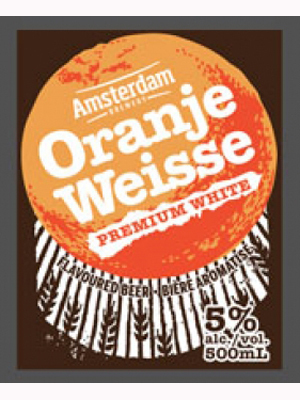 Amsterdam Oranje Weisse is available for sale in a 500mL bottle from the LCBO (product #242552), select Beer Stores, the Amsterdam Brewery Retail Store (21 Bathurst St., 416-504-6882) and on tap at fine bars and restaurants.